Wai Ming Co. is the Exclusive Distributor of U.K. Riley Snooker Table. 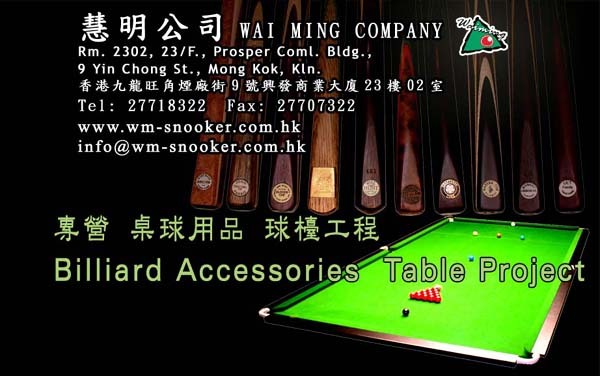 For over fifteen years, Wai Ming Co. is a profressional snooker specialist, providing services of repair, transport, dismantal & installation of billiard snooker tables, equipments and accessories. Our mission is to strive the best quality and service to our customers with our professional knowledge and enthusiasm. Over the years, we have established notable reputation in the industry. Our customers include sizable snooker clubs, luxious club house, education sectors, hospitals, recreation camp sites, disciplinary forces, non-government organizations, bars, resturants, hotels, private companies and individual customers, etc. We source and distribute many world-famous billiard cues and accessories, which both retail and wholesale are welcomed. Besides, we also provide soccer tables and air hockey tables of high qualities. We posses sufficient stocks, professional personnel and add-valued service, while our products and service are all in reasonable and good price. We welcome your requisition related to the industry, and we are pleased to give you professional advice. No.9 Yin Chong Street, Mongkok, Kowloon, Hong Kong.